July 6, 2011 by C.S. Clarke, Ph.D.
Here’s an excellent addition to my continuing feature of “good old books” that are relevant and helpful today. “The Way To Wealth,” (subtitled “Poor Richard Improved,”) was first published (not by that title) in Poor Richard’s Almanack in 1758. 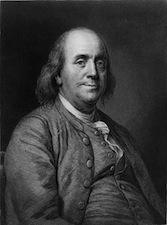 If you’ve read any of “Poor Richard’s Almanack” issues, you’ve undoubtably noticed the number of old sayings that Benjamin Franklin contributed to American culture. This particular book contains enough familiar old adages to make your eyes pop. As you might expect, Franklin holds forth on the value of working with vigor, enthusiasm and ambition to earn money and the value of frugality to keep what you earn. He does it pleasantly and with humor. It’s easy to see why so many people of his era thought him witty and charming. And, since he wrote much for the common man, it’s easy to see why his words are so extensively quoted. He made his fortune and became famous by being a printer. Having one’s own press allows for easy self-publishing in addition to publishing others. I’m sure that if he were starting out today, he’d have dozens of websites and blogs, thousands of ebooks, books, videos and audios. He’d also end up owning at least one movie studio and he’d film uncountable documentaries. Because of its title, more people want “The Way To Wealth” from Benjamin Franklin than his more interesting and informative autobiography. I think I learned more about growth and creativity from the autobiography. I recommend you read them both. I’ve actually uploaded both for you, despite my title for this post. As I’ve been doing so far, I’ve provided scanned copies of the actual old books rather than a cleaned up Gutenberg edition. I want you to get the feel of what readers of the original books saw. It may create a virtual atmosphere of the thinking and culture of the times and put the old books in better context. Time management concepts: What are values?